See your home in a new light! These beautiful Hartmann&Forbes woven shades look great in this Spring Lake, NJ kitchen area. Woven shades add great personality and style to your home, and we proudly feature Hartmann&Forbes and their line of fabrics handcrafted from sustainable materials.. Be sure to see check out photos of our woven wood shades! Give us a call today (732-223-6662) to find out about these and all the great choices and prices we have on custom window treatments for your home, many with automation options! The before & after shots in this Tinton Falls, NJ home are a good example of layering hard & soft window treatments. Initially there were only curtains, but after adding our beautiful $128 Any Size Window CORDLESS Faux Wood Blinds, the look really comes together! Fabric Roman shades are a great way to add personality to a room while still ensuring you'll have adequate privacy and light control. In this home in Wall Township, NJ, existing blinds were replaced with fabric Romans in the kitchen, bringing a warm feel to the room. It's not surprising that plantation shutters are one of the most popular window treatments around. Just have a look at these we provided for a home in Point Pleasant Beach. Elegant and simple, they complement any style of decor. These particular ones come with the front tilt bar for easy opening and closing of the louvers, and supply great privacy and light-control. Did you see our last post about the fantastic deal we have on cordless blinds? Here's the gist: we'll professionally measure & install these beautiful, custom faux wood blinds on any size window in your home for only $128 per window (residential only, 5 window minimum, price does not include tax)! These great blinds come in nine (9) attractive colors and are great for any room in your home. And, since we're the one company you'll to contact for sales, service and installation, the process is super-simple and streamlined! Some before & after shots in a Point Pleasant, NJ home. The original window treatments were textured roller shades, but these shutters with the hidden tilt bar (Invisitilt), provide a cleaner look and better view-through, as well as bringing great privacy and light-control to the room! Give us a call (732-223-6662) to find out about all the great choices and pricing we have on custom plantation shutters for your home! Custom plantation shutters on door in Point Pleasant, NJ. Custom plantation shutters in Point Pleasant, NJ. The before & after shots in this Brielle, NJ home show the variety of rooms and looks plantation shutters are suited for. These shutters with the hidden tilt bar (Invisitilt), which makes for a cleaner look and better view-through, go from casual to near-formal with no loss of style or function! As well as bringing the elegance, these shutters provide great privacy and light-control! Custom plantation shutters on door in Brielle, NJ. Custom plantation shutters in Brielle, NJ. We traveled to a Staten Island home that's being remodeled with these beautiful wood-stained plantation shutters. They look great on the doors, especially on the French doors. As you can see, plantation shutters aren't only for windows, and in fact create a great look for the doors in your home. Custom plantation shutters on door in Staten Island. Custom plantation shutters on French door in Staten Island. See your home from a new height! Motorized silhouette shades in a Red Bank, NJ living room are elegant and so very cool! Have a look at the video below,then find out why silhouette shades are a top choice for automation! And, not only are these controlled so easily by the pebble remote, but you can also use your smartphone or other devices like Amazon's Echo (with Alexa) to control them! Hartmann & Forbes is known as one of the premiere manufacturers of woven wood shades, and we're proud to offer their products, such as the beautiful shades seen in this Brielle, NJ home. In addition to perfectly complementing the already distinctive style in this home, these window shades offer great privacy and light-control. They're also available in many different textures, as well as with motorization options! Woven shades in Brielle, NJ. Detail of woven shades in Brielle, NJ. We're throwing back this Thursday to some beautiful automated silhouette shades in a Red Bank, NJ dining room. We are the Jersey Shore's motorized window treatment experts, and can outfit any home with motorization options! Silhouette shades bring an undeniable elegance to any room. Their versatile light control and privacy options only add to their awesomeness! Available in a large selection of fabrics and colors, silhouettes are a fine and tasteful choice for your windows. Motorized or automated window shades aren't just for fancy pants (although they certainly are something special to behold). Having motorized shades can also be very practical: they're great for hard-to-reach windows, and also come in handy in rooms with a large number of windows that need to have their coverings raised or lowered simultaneously. We've also found that many people with challenges, such as the elderly or physically-impaired, find great benefits from them as well, and let's not forget that the lack of cords makes them particularly child and pet-friendly! Have a look at the video below to see some motorized silhouette shades in action in a great looking dining room. You'll notice the "pebble" styled remote control, but these can also be controlled with an app on your mobile phone, and even through Amazon's Alexa devices with voice-control! In addition to the video below, check out this quick YouTube playlist of some of our motorized silhouette shades! Give us a call (732-223-6662) to find out about all the great choices and pricing we have on custom shades and shutters for your home! From home blinds to plantation shutters! Witness the difference as these children's rooms in Sea Girt, NJ get a window treatment upgrade. Custom plantation shutters in a Sea Girt, NJ child's room. Other window treatments such as plantation shutters, woven woods, Romans and cellular shades often get a lot of attention for their style points, but wood blinds are more than just an old standby...they look as great as they function, as witnessed by this home in Point Pleasant. At ASAP Blinds, we custom measure & install everything we sell for the best look for your home. These wood blinds provide great privacy and light-control, and look good doing it. Versatile enough to use in any room of your home, the value of these blinds is truly not to be overlooked as a window treatment choice! Before & after pics of custom wood blinds in a Point Pleasant, NJ living room. Before & after pics of custom wood blinds in a Point Pleasant, NJ dining room. Before & after pics of custom wood blinds in a Point Pleasant, NJ bedroom. Before & after pics of custom wood blinds in a Point Pleasant, NJ lbedroom. Before & after pics of custom wood blinds in a Point Pleasant, NJ stairwell. Before & after pics of custom wood blinds in a Point Pleasant, NJ bathroom. Before & after pics of custom wood blinds in a Point Pleasant, NJ room. Take a look at the plantation shutters with hidden tilt bar (Invisitilt) in this new Brielle home. The windows were initially covered by temporary paper shades, but you can still what a great difference the shutters made. They not only look and function great, but they also bring a great style to the rooms. At ASAP Blinds, we custom measure & install everything we sell for the best look for your home. These custom plantation shutters fit so perfectly in this home without calling too much attention to themselves by jumping out of the decor. The hidden tilt bar - also known as Invisitilt - provides a really clean look as there's no vertical bar needed to open and close the louvers (you simply tilt one louver to open or close that section). This also gives you a less obstructed view to the outside! Custom plantation shutters in a Brielle, NJ living room. Custom plantation shutters in a Brielle, NJ home. This week we're showing you one window with plantation shutters & hidden tilt bar (Invisitilt), and two with fabric Roman shades in this Mantoloking, NJ home. We all know how great plantation shutters are, and these with the hidden tilt bar (also known as Invisitilt) offer even better view-through to the lovely scenery outdoors. Some of the most elegant-looking shades, fabric Roman shades cover all the bases: they're great for keeping the sun under control, and keeping prying eyes out...and they look AMAZING! Give us a call (732-223-6662) to find out about all the great choices and pricing we have on custom shades and blinds for your home! Plantation shutters in Mantoloking, NJ. Fabric Roman shades in Mantoloking, NJ. This home in Rumson, NJ features woven wood shades from Hartmann & Forbes, creators of some of the most beautiful wovens we've seen. Bringing the natural feel of woods, reeds, bamboos and grasses into your home or office, woven wood shades are a fine way to add personality and style to your home without sacrificing all the things you seek in a window treatment, such as privacy and light control. With lots of styles and designs to choose from, you're sure to be pleased with the look and functionality of these geat window shades! The bathroom and bedroom were treated with temporary paper shades (as you can see in the "before" shots) before we installed the Hartmann & Forbes woven shades. Woven wood shades in a Rumson, NJ lbathroom. Woven wood shades in a Rumson, NJ bedroom. Woven wood shades in a Rumson, NJ kitchen. Who deosn't love plantation shutters? With their classic good looks and great light-control and privacy capabilities, they're a popular choice for home window treatments. But did you know that we can customize them to fit nearly any shaped window? Have a look at the doors and arches in the video below to see some examples! We've done a wide range of customized, specialty-shaped window treatments - from arches to portholes and more. No matter how unique your windows are, give us a call and let us show you the great options you have for covering them with style! We love how this space in a Sea Girt, NJ home combines kitchen, dining and entertaining areas into one agreeable and fun looking room. Choosing blinds as the window treatments keeps things simple and streamlined, with plenty of style and functionality: blinds are the standard when it comes to privacy and light-control with their adjustable slats and the ability to be raised and lower as one sees fit. Ask us if blinds are right for your home. Our experience and years of service in the window treatment industry guarantees you the knowledge you need to make the right decisions for window fashions in your own home! Plantation shutters are always one of our most popular products, and with good reason. As elegant and stylish as they are functional, they're a great choice for giving you privacy and light-control in a package that enhances the appearance of your rooms in a fantastic way. And shutters such as these with the hidden tilt bar (aka Invisitilt) provide a cleaner, less obstructed view. As you may know by now, we're Central New Jersey's leader in automated and motorized window treatments, which are great not only for convenience or for hard-to-reach windows, but they're also very useful for folks with disabilities that may not be able to reach certain windows. You may have seen some of the videos we've posted of remote-controlled shades and drapery, but what you may not know is that we can also motorize plantation shutters. That's right! Have a look at the video below to see how smooth and easy it is, then imagine that in your own home. This great little sunroom in Sea Girt, NJ has a lot of windows that let in a lot of light! Woven Roman shades are an excellent choice here for adding style along with privacy and light control! Our experience with years of service in the window treatment industry guarantees you the knowledge you need to make the right decisions for window fashions in your own home! Woven Roman shades in Sea Girt, NJ. This home in Bay Head, NJ has some great upstairs rooms that we were delighted to provide plantation shutters for! Plantation shutters are known for the great looks they bring to any room of your home. And with great options for privacy and light control, they're a practical choice as well...even for oddly shaped windows. As with the windows in one particular room of this home, we've created hundreds of specialty-shaped window treatments over the years for unusual windows (and doors too, such as sliding glass and French doors), so there's never a need to worry about bringing your vision to life when it comes to uniquely shaped windows. And because it's from ASAP Blinds, you know that it's quality you can trust! There's a reason that we're New Jersey's leading supplier of custom plantation shutters: our years of experience and the knowledge we bring to each job ensure that you're getting the best coverage for your windows at the best price, without sacrificing style or functionality. Custom, speciality-shaped plantation shutters in a Bay Head, NJ home. Custom plantation shutters in a Bay Head, NJ home. This home in Brielle, NJ was looking fine with blinds in the windows, but now that they've switched those out for plantation shutters, the look is much more captivating! Give us a call at 732-223-6662 to find out about all the great choices and pricing we have on custom plantation shutters for your home! From Blinds to Plantation Shutters in a Brielle, NJ home. This newly remodeled home on the water in lovely Bay Head, NJ gets the treatment with woven shades from Hartmann & Forbes and Horizon, as well as cafe shutters and stained plantation shutters! Woven shades are a great way to bring style coupled with light control and privacy into your home. Coming in a wide variety of textures and looks, these shades are a hit in any home! Inspired by the cafes of France, these half-height shutters let plenty of light in without sacrificing privacy. They're perfect for rooms where you want a consistent sense of openness and air. The stained plantation shutters in the TV room of this home will match the decor perfectly once it's all set up, and they'll also keep the light under control for optimal movie viewing! Woven shades in a Bay Head, NJ home. Woven shade detail in a Bay Head, NJ home. Cafe shutters in a Bay Head, NJ home. Plantation Shutters in a Bay Head, NJ home. 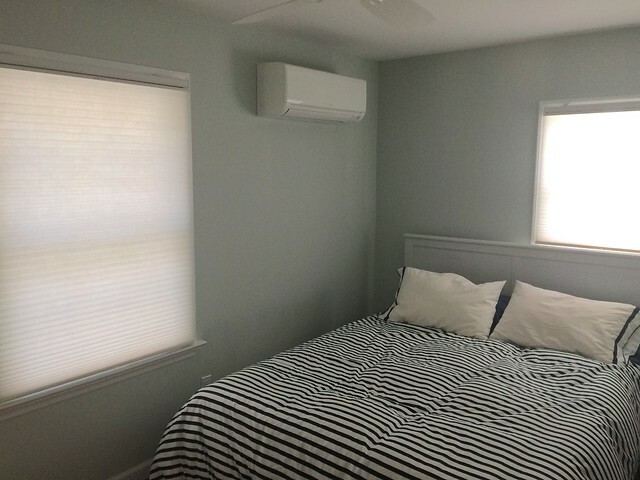 These bedrooms in Marlboro, NJ were fitted with cellular shades (aka honeycomb shades) for a sleek and effective look! As we've discussed before, cellular shades are a practical and great-looking style option for your home. Streamlined and effective, they provide excellent light control (and have room-darkening and blackout options for even greater control), and their top-down/bottom-up configurations provide more ways to control the light and your privacy. They can also help keep you cool in summer and warmer in winter due to the way their cells help capture and redistribute air, and they are a great candidate for motorization! Cellular shades in a Marlboro, NJ bedroom. This home in Rumson, NJ features woven wood shades donwstairs and faux wood blinds in a couple of the upstairs bedrooms. Faux wood blinds from ASAP Blinds are nearly indistinguishable from real wood blinds, yet are more durable and much less expensive, especially when you take advantage of our great $88 Any Size Window Blinds deal as these folks did! Woven wood shades in a Rumson, NJ living room. Woven wood shades in a Rumson, NJ dining room. Faux wood blinds in a Rumson, NJ bedroom. Have a look at the plantation shutters with hidden tilt bar (Invisitilt) in this Point Pleasant Beach home. They not only look and function great on windows, but they're also extremely well-suited for sliding glass doors and even a pantry, as you can see in the video and photos. At ASAP Blinds, we custom measure & install everything we sell for the best look for your home. These custom plantation shutters are just the ticket for this home and look great whether covering windows or sliding glass doors, and they make a nice touch on the pantry. Custom plantation shutters in a Point Pleasant Beach, NJ bedroom, including sliding glass door. Custom plantation shutters in a Point Pleasant Beach, NJ dining room. Custom plantation shutters on a pantry in a Point Pleasant Beach, NJ kitchen. Custom plantation shutters in a Point Pleasant Beach, NJ living room. Custom plantation shutters in a Point Pleasant Beach, NJ living room sliding glass door. From lights to thermostats to security cameras and more, everyone's talking about smart homes and all the ways you can control different things in your house with your phone. Window treatments with light-control and privacy options are no different thanks to the automated power of motorization! Imagine waking up in the morning and having your window shades automatically open at the time you've scheduled. Or, rather than having to walk to each window to close your blinds in the evening (some of which you have to reach over the couch or tub for, or stretch yourself into an uncomfortable position to get to), what if you could close them all in perfect synchronization with just one touch? This is just the beginning of the convenience and pleasure of automated window treatments. Motorized shades like the screen rollers in the video above are becoming more affordable and better looking than ever. We have a large variety of custom window treatments that can suit any need! All of our automated systems can be controlled via either an included handheld remote or with an app from your smartphone or tablet. And we'll show you how to set up scenes and schedules, and make the process simple so you can enjoy your smart shades right away! If you have an Amazon Echo or Dot, you know how advantageous that can be for so many different things. And now you're able to control your motorized window shades with voice commands through these and similar devices! We'll help you get set up and on your way to a truly hands-free experience! We've found that the convenience of automated, motorized window treatments gives greater independence and control of their environment to the physically disabled and wheelchair-bound. By using an app, remote-control or voice commands, the opening and closing of window shades becomes less of a chore, and frees up time for other, more important activities! At ASAP Blinds, we have the most knowledgable, creative and experienced staff for designing and installing your automated window treatments. We've had years of experience with both hardwired systems in new homes and hidden battery systems when hardwiring isn't an option, and our understanding & ability with both is unsurpassed! Give us a call at 732-223-6662 today to find out more about motorized options for your home. We've got a solution for you! Faux wood blinds were a great choice for this home in Belmar, NJ. Plus, see if you can spot the cordless cellular shade on one of the windows! Faux wood blinds are as durable and attractive as real wood blinds but at a fraction of the cost. These blinds are a cinch to operate and designed to withstand the elements, including light, heat, moisture, and salty air. They have a tight closure for minimal light leakage, and are made from materials that are lead free, V.O.C. free and without any harmful chemicals. Give us a call (732-223-6662) to find out about all the great choices and pricing we have on faux wood blinds! Faux wood blinds in a Belmar, NJ home. Faux wood blinds in a Belmar, NJ home. And checkout the cordless cellular on the door! Have a look at this home in Sea Girt, NJ that we fitted with honeycomb shades (aka cellular shades) on the windows and the sliding glass door! Available in an amazingly wide array of colors, honeycomb shades are one of the most popular choices for covering your home's windows. Super-stylish and easy to use and maintain, they're available in cordless options (as shown here), top-down/bottom-up, and with further light control via room-darkening and blackout capabilities. They're also a popular candidate for motorization. Besides their great looks, they're great for keeping your utility bills in line due to the way the cells of the shades trap and recirculate air to keep the temperature in your home comfortable and fiscally manageable! Honeycomb shades in a Sea Girt, NJ bedroom. Honeycomb shades in a Sea Girt, NJ home. Cordless, patterned fabric Roman shades make an elegant and impactful statement in this South Orange, NJ home! Available in a variety of patterns, textures, and fabrics, Roman shades can add a distinguished look and luxurious style to bedrooms and dining rooms, and - as you'll see in this video - kitchen and living rooms can also benefit from these great shades. But it's not just looks that make these beautiful shades so popular...they're great for privacy and light control too. Fabric Roman shade in a South Orange, NJ kitchen. Fabric Roman shades in a South Orange, NJ living room. Detail of Fabric Roman shade in a South Orange, NJ home. Plantation shutters with Invisitilt (hidden tilt bar) look great at this home on the water in Brick, NJ! With great privacy and light-control options, these shutters are perfect for bedrooms, and nearly any other room in your Jersey Shore home! Plantation shutters offer a distinctly stylish and sophisticated look to the rooms of your home. With the ability to open & close louvers, as well as to open the shutters (like a cabinet door), they also provide multiple options to control light, protect your privacy, and offer a view to the outside when desired. Shutters such as these that have the hidden tilt bar (aka Invisitilt) offer a cleaner view-through and won't clash with multiple window panes or grids! Plantation shutters in a Brick Township, NJ bedroom. Plantation shutters in a BrickTownship, NJ bedroom. Wood blinds are a classic window treatment choice due to their good looks, functionality, and ability to work well in any room or decor. We put some in recently remodeled bedrooms of an Ocean Township, NJ home and the results (prior to room decorations) are below. No matter what style choices are made in these rooms, the blinds are guaranteed to look great! White wood blinds, such as we have in this week's Job of the Week, provide stylish light control and privacy, and look great alone or when paired with drapery or shutters. Their classic good looks and affordable pricing make them a great choice for any home! Wood blinds in an Ocean Township, NJ bedroom. *Please note: for many years there has been some concern about safety hazards with corded window treatments such as home blinds. Most of these issues come about from a broken equalizer on the blinds, which leads many people to simply tie the cords to maintain functionality, but in the process that creates a hazard. To help prevent this, we have a video that shows how to easily repair your blinds' equalizer yourself to help you avoid that situation. We're in Manasquan, NJ with versatile top-down/bottom-up cellular shades, including some room-darkening ones, and a great VertiGlide vertical shade on the kitchen sliding glass door! Cellular/honeycomb shades are an extremely versatile window treatment option that provide all the great things you expect from the best window coverings: style, privacy, light and temperature control...all while coming with an assortment of colors and operational choices (motorization, top-down/bottom-up, etc.). These are top-down/bottom ups in this home, and the bedrooms include room-darkening for better sleep! Sliding glass doors always require a little extra thought. In this kitchen, a VertiGlide vertical cellular was the perfect choice, as you can see at the end of the video or in one of the photos below. Top-down, bottom-up room-darkening cellular shades in a Manasquan, NJ bedroom. VertiGlide vertical cellular shade on sliding glass door, top-down/bottom ups on windows. For this family room in South Plainfield NJ, cellular shades and a patterned fabric valance were just the ticket! Cellular/honeycomb shades are an extremely versatile window treatment option that provide all the great things you expect from the best window coverings: style, privacy, light and temperature control...all while coming with an assortment of colors and operational choices (motorization, top-down/bottom-up, etc.). Cellular shades & fabric valance in a South Plainfield, NJ living room. This home in Manasquan, NJ was in need of some new window treatments, and we were happy to oblige! The vertical blinds in the dining room were replaced with plantation shutters (with hidden tilt bar) for a cool & elegant look, and the roller shades in the bedrooms were replaced with wood blinds for a clean & fresh effect. Both plantation shutters and blinds offer great privacy, light-control, and view-through options. Plantation shutters in a Manasquan, NJ dining room. Blinds in a Manasquan, NJ bedroom. This week we're in Point Pleasant, NJ with cordless cellular (honeycomb) shades in a kitchen and living room. Cellular shades are also known as honeycomb shades due to the shapes of the cells on the shade. These cordless shades are a great option in any room as they are great for privacy, light-control and for helping control room temperature due to the way the cells control air. Cellular shades in a Point Pleasant, NJ kitchen. Cellular shades in a Point Pleasant, NJ living room. We're in Lavallette, NJ this week, replacing window blinds with plantation shutters! When it was time to replace the blinds in this home, plantation shutters were a natural choice for the way that they open up the room. These shutters feature the popular Invisitilt hidden tilt bar, which provides a cleaner view to the outside. They also offer more ways to control the view and the lighting: the shutters can be swung open (much like a door) for a full view to the outside, and the split louvers allow just the top or bottom half of the shutter slats to be open or closed as desired, giving you plenty of light-control options! Come talk to us and let our years of experience and knowledge help you with the right decisions for window fashions in your own home! From blinds to plantation shutters in a Lavallette family room. More blinds to plantation shutters. This week we're looking at several different window treatments in a Mantoloking, NJ home. We started with Roman shades and cafe shutters in upstairs bedrooms. Next there's a plantation shutter in the pink bathroom, and another plantation shutter in the stairway. Then room-darkening cellular shades with curtains and fabric valances in other bedrooms before we have another view of the plantation shutters in the stairway, and finally a view from outside the house! Before & after of plantation shutters in bathroom. Before & after of cafe shutters in bedroom. Cellular shades and custom drapery in bedroom. Cellular shades and fabric valance in bedroom. Honeycomb shades in a Westfield, NJ home. Cellular shades are a great choice for nearly any room, and they look great in this bedroom/study in Westfield, NJ! Also known as honeycomb shades, cellulars can help keep your utility bills in line as well as provide privacy and light control. Be in touch with us to find out how! Plantation shutters in a Manasquan, NJ home. These white plantation shutters look great on the windows of this Howell, NJ home! Featuring Invisitilt (the hidden tilt bar) for better view-through and style, these shutters add elegance to the living room. Be sure to have a look at the specialty shaped shutters on the thin front door side lights in the foyer as well. We're able to provide solutions for nearly any size and shape of window you may have. Wood blinds and cafe shutters in a Manasquan, NJ home. Roman Shades in a Brick, NJ home. This Jersey Shore home now has a variety of Roman shades with different fabric patterns to match the different rooms! Roman window shades are a great choice to supply an elegant personality to any room, and are available in a wide variety of patterns & fabrics, as well as many great woven wood textures. Besides their great looks, they are an excellent provider of privacy and light & temperature control! Wood blinds, woven wood shades, drapery, and even a plantation shutter in a Brielle, NJ home. This Jersey Shore home got a variety of window treatments, and here are some before & after pics (and video) of a few of them: home blinds in a bedroom, woven wood shades in the dining room, and curtains and a plantation shutter in another bedroom. All of these different styles provide great privacy and light-control options, and well as a varied yet unified look throughout the home! Give us a call at 732-223-6662 and let us find the perfect window fashions for your home! Vignette window shades from Hunter Douglas are known as "The Modern Roman Shade" for good reasons. Let's have a look! As you'd expect from Roman shades, Vignette shades come in a variety of elegant textures and colors which offer a clean, crisp look that stays consistent and wrinkle-free. No exposed cords may seem like a great design decision, but it's also a great safety decision as cordless shades are safer for children and pets. These shades are available with cordless, top-down bottom-up, and motorized options. Semi-sheer, light-filtering, or room-darkening? Have your pick! Vignette shades are available in all three, as well as a range of styles and fold sizes! Have a look at the before & after pics of Vignette shades in the bathroom of this Ocean Township home, and give us a call to find out more about these versatile "modern Roman shades" and how great they'll look in your home! Before & after shots of Vignette shades in an Ocean Township, NJ home. Faux wood blinds in a Jersey Shore home. This week we're having a look at faux wood blinds and how great they look in different bedrooms and even a bathroom! Faux wood blinds are made from materials that are lead-free and free from any harmful chemicals, and they can withstand different climate situations such as moisture and salty air better then hardwood blinds while being just as attractive at a fraction of the cost. Give us a call at 732-223-6662 today to find out about the Best Blinds Deal in New Jersey for Any Size Window! Please note: for many years there has been some concern about safety hazards with corded window treatments such as home blinds. Most of these issues come about from a broken equalizer on the blinds, which leads many people to simply tie the cords to maintain functionality, but in the process that creates a hazard. To help prevent this, we have a video that shows how to easily repair your blinds' equalizer yourself to help you avoid that situation. In this week's edition of JOB OF THE WEEK, we're installing white wood home blinds and plantation shutters in a Brick, New Jersey home. To see individual before & after photos, check out our Facebook Photo Album for this project! Something that's unique about these bedroom windows is that they already had existing treatments on them that the owners wanted to keep. It's easy to forget that layering different types of window treatments is not only okay, it can result in some great looks. For these windows we went with white wood blinds under the fabric valance in one room, and under the curtains in the other. It's a simple but effective way to freshen up a room and add more privacy options. Wood blinds in a bedroom. This bedroom was recently remodeled and still needed some touch-up painting, and we were called in to install white plantation shutters with hidden tilt bars (Invisitilt). It's easy to forget that not only do plantation shutters have louvers that open and close, but they also swing open much like little doors. You can see that in the photo where our Master Installer Drew is putting on the finishing touches. Plantation Shutters in a bedroom. Finally, here are before and after photos of plantation shutters in the living room. They provide great privacy and light-control and look great! Plantation Shutters in a living room. ASAP Blinds in Manasquan NJ has you covered for all of your window treatment needs in Monmouth & Ocean Counties and throughout New Jersey. Call us today at 732-223-6662 and find out about our large selection of blinds, shades, shutters and other window treatment options, including motorization! This home on the water in Brielle, NJ has its living room dressed up nicely with Nantucket shades from Hunter Douglas. Nantuckets are a smart option for those seeking the elegance of Silhouette shades at a better price without sacrificing the look and options. The similarities between the two types of shades are so great in fact, that we recently did a blog post comparing Nantuckets and Silhouettes here. Most of the vanes on the shades shown in the video and the photos below are open, allowing a great view to the outside, but notice the sliding glass door in the first set of before & afters: the vanes are closed, giving you an idea of the great privacy and light-control these soft home shades can bring to your rooms. And like so many of the custom window fashions we offer, these shades are a great choice for automation/motorization! To see more before & after photos, check out our Facebook Photo Album for this project! ASAP Blinds in Manasquan NJ has you covered for all of your window treatment needs in Monmouth & Ocean Counties and beyond. In addition to Nantuckets and Silhouettes, we have a wide variety of options for plantation shutters, cafe shutters, window blinds, cellular & roller shades, woven wood & Roman shades, and more! Call us today at 732-223-6662 to find out more! Fabric Roman shades are an elegant choice at this Bay Head, NJ home. These cordless, knife-pleated fabric Roman shades offer great privacy and light-filtering abilities. We went with a common valance as the windows were situated nicely in pairs. These window shades are also available with further room-darkening options for those seeking to make their room even darker. ASAP Blinds in Manasquan NJ has you covered for all of your window fashion needs in Monmouth & Ocean Counties and throughout New Jersey. Call us today at 732-223-6662 to see the other Roman shade and home window blinds options we offer! Plantation shutters and cafe shutters were the perfect combo for this home in Sea Girt, NJ. Have a look at the before & after photos below and in the video to see! All of these shutters feature the Invisitilt option, which is a hidden tilt bar. Shutters with Invisitilt have a cleaner, more-streamlined look and offer better view-through when looking to the outside. ASAP Blinds in Manasquan NJ has you covered for all of your window fashion needs in Monmouth & Ocean Counties and throughout New Jersey. Call us today at 732-223-6662 to see the other Roman shade and plantation shutter options we offer! Window treatment options are virtually limitless. In this week's JOB OF THE WEEK, we're taking a look at before & after photos of woven wood shades, Nantucket shades, wood blinds, and plantation shutters...all in the same new Avon-by-the-Sea, New Jersey home. To see individual before & after photos, be sure to check out our Facebook Photo Album for this project! In the above video, check out these woven wood shades in a living room off the porch, followed by similar wovens on a French door and windows. Check out the texture of those woven weaves! Wovens are a great choice for French doors, and they offer a stylish look with great light-control and view-through...simultaneously! Nantucket shades are very similar to, though less expensive than, Silhouette shades. For a full breakdown of the differences, see this post. Nantuckets are also a great candidate for motorization...in fact, the shades above the bathtub in the video are automated, and you can see them in action here! These shades give a great and luxurious look to any room. You can't go wrong with wood blinds. Classic, practical and stylish, they work in any room and always look great! In a home such as this, where various elegant window treatments are being used in many of the main rooms, wood blinds are a cost-effective way to dress up less frequently visited rooms! Another classic window covering, plantation shutters offer great looks, fantastic options for viewing the outside world, and extremely effective light-control. These shutters have an invisible tilt bar (known as Invisitilt) that brings less obstruction to your view and a cleaner look to your window. ASAP Blinds in Manasquan NJ has you covered for all of your window treatment needs in Monmouth & Ocean Counties and throughout New Jersey. Call us today at 732-223-6662 and find out about our large selection of blinds, shades, shutters and other window treatment options. Woven wood shades were the natural choice for this Central New Jersey home! Woven wood shades are an excellent window treatment choice and have many benefits. Besides being made from natural, eco-friendly materials, they provide great UV ray protection. Their unique textures bring personality and style to any room, and they're available with many great options including motorization and room-darkening liners. Have a look at the video below, or through the photos beneath that, and check out how great these woven shades look in the kitchen. It's a fun, practical look over the sink, as well as on other windows in that room. We also show you how fine these shades look in other rooms throughout the house, such as the living room, the dining room, the family room, and a bedroom suite. No matter the room, woven wood shades bring a great touch of personality and style in the most natural of ways! Woven wood shades in a living room. Woven wood shades in a kitchen. Woven wood shades in a dining room. Woven wood shades in a family room. Woven wood shades in a bedroom. ASAP Blinds in Manasquan NJ has you covered for all of your window fashion needs in Monmouth & Ocean Counties and throughout New Jersey. Call us today at 732-223-6662 and find out about our large selection of woven wood shades and other window treatment options. For this Jersey Shore home, motorized honeycomb shades in the sun room was just the ticket to convenice and style! Honeycomb shades (also known as cellular shades) are a great help in keeping rooms cool in warmer weather and warm during colder months due to the way the cells of the shades help control how air is circulated in the room. Motorization (or automation, as it is sometimes called) allows for easily raising and lowering window treatments with minimal fuss and with great style. So, it's a great pairing in all respects, including privacy and light-control! And, this is a fine example of how motorization - which is often associated with luxury, but which in reality is becoming more affordable all the time - isn't only for "fancier" rooms or homes...it's an asset in any room! Automated cellular shades in a sun room. ASAP Blinds in Manasquan NJ has you covered for all of your window fashion needs in Monmouth & Ocean Counties and throughout New Jersey. Call us today at 732-223-6662 to see the other honeycomb shade and motorization options we offer, as well as our large selection of custom window treatments! For this home in Brielle NJ, we've got plantation shutters in a living room and two bedrooms, and vertical cellular shades on a sliding glass door in a kitchen dining room. The plantation shutters feature a hidden tilt bar (also known as "Invisitilt"), which means that there is no wand for opening and closing the louvers, giving you better see-through visibility when the louvers are in the open position. These shutters also have a "split tilt," which allows the top half and the bottom half of the shutters to be opened or closed independently of each other, giving you more privacy and light control options. The kitchen dining room has a sliding glass door which is covered with a sliding vertical cellular shade, allowing great privacy and light control in a stylish and functional manner. Before & after of white plantation shutters in a living room. Before & after of vertical shade on sliding glass door in a kitchen dining room. ASAP Blinds in Manasquan NJ has you covered for all of your window fashion needs in Monmouth & Ocean Counties and throughout New Jersey. Call us today at 732-223-6662 to see the other plantation shutter and options for sliding glass doors we offer, as well as our large selection of window treatments! For this new home on the water in Lavallette, NJ, the right choices were a lovely fabric Roman shade over the sink in the kitchen, and white plantation shutters on the other kitchen window overlooking the lagoon, as well as on the windows leading into the dining room. With both privacy and light-control in mind, these solutions were a winning combo! Silhouette window shadings by Hunter Douglas are one of our most popular and attractive window treatment options. Nantucket window shades are very similar and nearly as popular as Silhouettes, so we'd like to take a moment to discuss the differences. Silhouette shades are a beautiful window shade comprised of two fabric panels with adjustable fabric vanes that seem to be floating between them (see photo below). With the vanes open, a view through the panels to the outside is filtered through the fabric that provides great UV protection (at least 75%!) and light diffusion. Closing the vanes provides even better light control that can protect your furniture, flooring and artwork from UV rays, as well as giving you the privacy you need. Available in a nice selection of colors, Silhouettes are an elegant home window shade that make a fashionable choice for our motorized and automated window covering options. The ambient lighting created by the shades is beyond compare! You can see a video playlist of some of our motorized Silhouettes in action here. Silhouette shades providing soft light filtering. Nantucket shades are very similar to Silhouette shades, and in fact are nearly indistinguishable to the untrained eye. With comparable color choices and UV & light-diffusing characteristics, Nantuckets are a more budget-friendly shade due to fabric and maufacturing differences, and have a somewhat more casual appeal. They also are great for our motorization options and provide a great deal of style to any room (see photo below). Nantucket shades on windows and a sliding glass door. Which is best: Silhouettes or Nantuckets? Silhouettes are the better choice for durability and a more elegant look. They're also one of the more expensive window treatments you can buy. Nantuckets are kinder on your wallet and, while they look and behave nearly identically to Silhouettes, the construction and fabric isn't quite the same, making it a more affordable yet still attractive option. ASAP Blinds is the leader and expert when it comes to designing and installing automatic/motorized window treatments in your home. We've brought a tremendous variety of window treatment styles to homes up and down the Jersey Shore and throughout New Jersey, New York and Pennsylvania. Give us a call today at (732) 223-6662 to find out why! Nantucket Shades look great on nearly any window in this riverfront home, even on sliding glass doors! Like Silhouette Shades, Nantuckets provide great UV protection and light diffusion, which is great not only for your furniture but also for the style and mood of your room. The vanes tilt to provide flexible light and view-through control, and there are motorization options available for the ultimate in style and convenience! ASAP Blinds in Manasquan NJ has you covered for all of your window treatment needs in Monmouth & Ocean Counties and throughout New Jersey. Call us today at 732-223-6662 to find out more about Nantucket window shadings and the many other solutions we offer! Though it may not be the first that comes to mind, one window treatment need that we see fairly often in Point Pleasant Beach and other Shore towns is a window in a stairway. For this particular one, woven shades are a great choice for their style and light control. Cellular shades (also known as honeycomb shades) are a great choice for the windows of this beach house. Simple and clean, they provide just the right amount of light control and privacy, plus they can help on heating and cooling bills with the unique "honeycomb" design of their cells. Sometimes plantation shutters are used in unexpected ways! Plantation shutters provide a stylish and attractive (dare we say romantic?) elegance to bathrooms, especially when placed on windows situated near a large or free-standing tub, or with a modern shower, as seen in the photos below. Whether it's privacy, light control or good-looks that you want - or a combination of them all - these indoor shutters are a sure winner, even on smaller windows! White plantation shutters with Invisitilt above tub. White plantation shutters with Invisitilt in shower. What are other good rooms for Plantation Shutters? Plantations shutters look great no matter where you choose to have them installed, as you can tell by these before and after shots from a laundry room in Point Pleasant, NJ. White plantation shutters with Invisitilt in laundry room. And these pictures from a bedroom...notice how the upper louvers are open (blowing out our camera lens a bit with the glare!) and the lower ones are closed. This split tilt option gives you lots of flexibility! White plantation shutters with Invisitilt in a bedroom. As you can see, plantation shutters are a great way to control the light in your home and fit in perfectly with the beach atmosphere of the Jersey Shore. The louvers can be tilted to let the sun in or keep it out, and the whole shutter panel can be opened for a wide view outside or closed for the utmost in privacy. They're also long-lasting, require little maintenance, and in some cases may even increase the value of your home. They look great in any room, as well as looking great from outside your home. At ASAP Blinds, we offer a great-looking selection of plantation shutters from some of the most respected brands in the business, and we custom measure & install on each window for the perfect fit and look. Call us at (732) 223-6662 with any questions you have, and to find out about the many options you have for blinds, shades and shutters in your home! Here's a house in Farmingdale, NJ with arched windows in the living room. Custom drapery was the perfect touch! On another window, we went for a layered effect with a sheer shade beneath the curtains, adding a further dimension of elegance & style that keeps a nice view outside while cutting the light a bit and providing privacy. Bay windows are a great opportunity for a number of different window treatment options. At this home on the Jersey Shore, we went with woven Roman shades for a classic beachy feel. Woven shades have a nice texture (see the close-up photo further down and check out the tassel too), and bring some of that outdoor feel into your home. And they are a great choice on bay windows stylistically, and for privacy and light control! Automated window shades for the home are becoming increasingly popular. With the advent of "smart home" technology, it's no surprise that power window treatments would be one of the most in-demand items for making homes more efficient and luxurious. Motorized Cellular Shades are a popular choice that work well in any room of your home. Cellular shades (also known as honeycomb shades) are a window covering named for their defining characteristic: the cells which resemble honeycombs. These cells are able to trap air and act as a buffer between the window and the room, thus helping with home heating and cooling bills. They're made of soft materials and can come in a number of different colors, as well as options for enhanced room-darkening, which is a useful add-on for certain windows and rooms. Cellulars can also be raised or lowered, allowing a full view out the window, but do not have slats or vanes which allow you to peer through the shade as you would with blinds, shutters, or soft treatments such as Silhouettes. Cellular shades providing soft light filtering. How Do Motorized Window Shades Work? Motorized window shades are controlled using a remote device (or an app on your smart phone or tablet) that lets you lower and raise them automatically. It's a great convenience being able to adjust your room for privacy or light control with the tap of a button - and a true godsend for high or hard-to-reach windows! It's also very easy to set the shades to automatically raise and lower at certain times of the day, freeing you from having to make those adjustments yourself. The options are nearly limitless! Below is a video of a set of cellular shades that are paired with a fabric valance. Watch them in action! Why Buy Automated Window Shades? Besides their elegance, convenience, and distinctive design, motorized blinds and shades have many practical uses. They're great for hard-to-reach windows, and for rooms where raising and lowering all window coverings at once is preferred, such as in a bedroom or home theater. They're also child & pet-friendly, making your home safer for the little ones in your life. ASAP Blinds is the leader and expert when it comes to designing and installing automatic window treatments in your home. We work with builders during the early stages of a home’s development to ensure the best wiring options for you, but we can also create the perfect motorized experience for you no matter the age of your house. Give us a call today at (732) 223-6662 to find out how! Motorized honeycomb shades in a beach house living room. This week we have a customer who's replacing their old vertical blinds with white plantation shutters in their bathroom and living room. These before & after photos reveal the stunning difference. The plantation shutters are easy to care for and provide a hassle-free way of controlling light and privacy. Remember: not only can the louvers on the shutters be opened for a view outside, but the whole shutter panel can open, giving a clear and unobstructed view! We had to share this before and after photo of a classic and clever use for interior plantation shutters. Fuse boxes are never the most attractive thing in the house, hence they're often tucked away in some remote area away from all the action. In this case, the fuse box was on a stairway leading to the basement, so we found a great - if not stylish - way to cover it up! White plantation shutter covering fuse box. What are the advantages of Plantation Shutters? Plantations shutters are a great looking window covering, and offer a variety of ways to control the light in your home: the louvers can be tilted to different degrees to let the sun in or keep it out, and the whole shutter panel can be opened for a wide view outside or closed for the utmost in privacy. Besides all of this, they can even look great as a wall covering for unsightly fuse boxes and such! Have a look at this new home with white plantation shutters featuring 2-1/2" louvers and front tilt bars, making them an excellent choice for any room. Of special note are the Bypass Plantation Shutters on the sliding glass door...these shutters easily slide to the side for access to the door, and make for great privacy and light-control when closed. Watch as we transform rooms in this lovely traditional-style home. We start with the dining room where cafe shutters provide privacy while maintaining a great view to the outside. Next, woven woods by a kitchen table are a fine way to keep the sun at bay when needed, and the same goes for the wovens in the kitchen overlooking a sunroom. At the top of a stairwell, cafe shutters let just the right amount of light in. For the living room and master bedroom, we went with motorized Nantucket shades from Hunter Douglas, utilizing their PowerView technology. With these automated window shades, the shades can be set to open and close at predetermined times, as well as automatically anytime via the included remote control for a perfect combo of convenience and elegance! Why are blinds such a popular choice for window treatments? Basically, a window blind is a popular type of window treatment (window covering) that generally consists of several horizontal slats that are held together by cords that can be used to open and close these slats, and raise or lower the slats all at once. Blinds also may come with vertical slats, and some have other mechanisms such as wands or remotes for opening and closing the slats. The slats are made of a hard material such as wood, faux wood (which is a composite of wood and man-made materials), plastic or metal, and come in a variety of colors, with white generally being the most popular. They are the ideal simple window treatment for any room in the house, inlcuding living rooms, bedrooms, bathrooms and kitchens. White wood blinds in a dining room. When someone says "blinds for windows," they may be speaking generically about any number of types of window treatments, but for our purposes here we'll stick to the specific type of blinds we mentioned above as opposed to other window coverings like shades and shutters. Home blinds are a classic way to cover your windows for privacy and light control with style. They look great in any room of your home, and with a variety of colors to choose from can match any decor. With a very simple procedure for opening and closing them, horizontal blinds can let in as little or as much light as you like by adjusting the slats' open & closed positions, as well as by lifting the whole row of slats upward for a nearly complete view out the window. Similarly for vertical blinds, which are a popular choice for sliding glass doors, except that the fully open/closed position is from left to right instead of up & down. The most popular blinds with our customers are the 2-inch wood blinds, though slightly larger slats are also in demand. Since the faux wood blinds are less expensive while maintaining the look and feel of real wood blinds, we have a lot of requests for them as well. In either case, our window blinds are an affordable solution for any room in any home! Stained wood blinds in a bathroom. At ASAP Blinds, we offer a wide selection of window blinds from some of the most respected brands in the business, and we custom measure & install on each window for the perfect fit and look. Call us at (732) 223-6662 with any questions you have, and to find out the great options you have for blinds in your home! Vertical blinds on a sliding glass door. We start in the kitchen, with two bare windows and one with a temporary shade on it, then fade into the same kitchen shot with beautiful woven wood shades on the two previously empty windows, and a custom wood blind on the other. Next, it's into the dining room with several windows covered by temporary shades that we transform with custom wood blinds! On to the living room, which also has its windows covered with temporary shades, but not for long! Look how great they are with custom wood blinds! From there we make our way into a tiny bathroom with a cute little window above the toilet, which also looks great when you see it covered with a custom wood blind! Up the stairwell with two large uncovered windows that also benefit from custom wood blinds. Finally, we enter a bedroom with an uncovered window and door that leads out to a deck. Voila! Custom room-darkening honeycomb shades provide the right amount of privacy and light control! Here we are installing white plantation shutters with hidden tilt bars on a bay window in a newlywed couple's home. Plantation shutters provide a classic look to any room, and are a great choice for privacy and light-control concerns. With summer coming around, remember that plantation shutters and other window treatments are an excellent and thoughtful gift for newleyweds or new homeowners! What are cafe shutters and why should I choose them over traditional or plantation shutters? Cafe shutters get their name from their popularity in restaurants and cafes, particularly in France, where they protected the privacy of the patrons while still allowing much of the outside sun and scenery in. As you can see in the pictures from a recent job of ours that are included in this article, cafe shutters for windows cover just the bottom portion of each window, yet retain the look and feel of classic shutters, including having options for louver sizes and a choice of a front tilt bar or a hidden tilt bar for opening and closing the louvers. Before and after photos of cafe shutters with front tilt bars. Because they don't cover the full window, you have a great balance of light and privacy in rooms where the windows are fitted with cafe shutters. This balance is great for kitchens and bathrooms, as well as any other room where you don't feel the need for full window coverings. In addition to the abundance of light you can allow in, you're also maintaining the nice view your window affords. Cafe shutters are also very versatile in that they can be teamed with other window treatments such as curtains and even Honeycomb or Roman shades for a stylish and luxurious look. Less expensive than plantation shutters, cafe shutters still provide the great look of those popular window coverings but with a more "open" look. Before & after photos of cafe shutters with drapery. We offer a wide range of cafe shutters from some of the most respected brands in the business, and we custom measure & install every shutter for the perfect fit and look. Give us a call at (732) 223-6662 with any questions you have, and to find out the great options you have for cafe shutters in your home! This week's home features top-down, bottom-up cellular (honeycomb) shades in a dining room, living room, and a couple of bedrooms! It's really cool the way these shades can be opened from the top or the bottom (or both), giving several options for privacy and light control. In addition, cellular shades are a great choice for controlling your energy bill as they provide great insulation in winter months, and keep your air conditioning in during the summer! For the sliding glass door off the dining room, we went with a vertical option, which keeps with the flow of that type of doorway. Maybe you’re moving in to your brand new house and you’re faced with a ton of windows with nothing in them. On the other hand, you might have a room that needs sprucing up which will require a new look for your windows. It might simply be one window or door that you’ve been putting off covering. Whatever the case, you feel overwhelmed with all the choices. The thought of looking at all the possible options with the unlimited color and pattern choices with the additional worry about cost makes people want to put off the task for another day. The process of buying window treatments can appear daunting but it can be quickly simplified by asking a few simple questions. 1. Light Control, Privacy...or Both? The first question determines the priority of what you’re trying to accomplish in terms of function, and the answer is usually ‘privacy’, ‘light control’ or a combination of both. By assessing each window in terms of where it’s located in the house and what it looks out upon, we can decide the functional priority. Let’s say the windows are on the ground floor and look out upon the street or a sidewalk. You’ll want to be sure that what level of privacy you’re comfortable with is doable with your treatment choice. Another big thing to consider is the direction your windows face. Windows that face south and west mean lots of afternoon sunlight and if you watch TV or spend a lot of time in those rooms, you’ll want to be sure you control the glare. Windows facing east means morning sunshine, sometimes very early. If you or your guests aren't early-risers, you’ll need to control that light. The control might mean simply diffusing it or in some cases, blocking it out all together. Maybe your windows face east and you have a view of the ocean or the bay. If you’re looking to cover your living area windows with that view, you’ll want light-control while not eliminating the view. Windows that face north won’t be getting much light so while you need privacy, you’ll still want to maximize what light you do get. 2. Which Treatments to Choose? Once you answer some of these basic questions, you’ll find that certain treatments will work better than others in accomplishing your goals. All treatments have advantages and disadvantages. Everything we sell represents style and quality but not everything will work for your particular windows and needs. Doing the aforementioned assessment before meeting with us is very helpful in enabling us to focus on particular products that will work best for you. Contrary to what some folks think, you don’t have to do everything all at once. The windows in your bathrooms and bedrooms are areas you’ll want to prioritize from a privacy standpoint but other areas like living space might be able to wait. Often times in a new home, being able to ‘live’ in it a while will help you decide on a particular look you’d like to have. It goes without saying that your budget will play a significant role in the treatments you choose. This will often be the case when building a new home. Funny how the costs for construction, furniture and appliances have a way of exceeding even the most well thought out estimates. As window treatments are often one of the last things done, it’s likely you’ll be limited in what you can spend for window decor. That’s the great thing about ASAP Blinds and the wide range of manufacturers and quality products we represent: we’re able to work with practically any budget. It’s usually a good idea to share some general budget restraints with us early on so we can show you products and ideas that fit into ALL your needs. Like many other things in life, the choice of window treatments can pretty much be as easy or as hard as you like. For 17 years, ASAP Blinds has made the process easy and affordable for everyone. Here's a slideshow of photos from a recent project we were pleased to work on. Before & After shots of honeycomb (cellular) shades in a bedroom, a bathroom, and a child's room with a bunk bed. Even a simple window treatment such as this can do wonders for any room. Honeycomb shades provide stylish privacy and light-filtering, and their design also contributes to insulation! Here's a look at a recent job where we installed Roller Screeen Shades with beautiful views of Monmouth Beach, the Navesink River, and NYC. Take a look at this view! The screen shade cuts the glare while still providing some privacy and an unobstructed view! Here's the room-darkening shade halfway down with screen shade completely down. And here's the darkening shade all the way down. Great energy efficiency & makes the room nice and dark for sleeping. Check out the deep jambs to accommodate both treatments. Virtually unnoticeable from within the room itself! There are so many choices for window treatments, and we want to help you narrow down what is best for you. Wood blinds are a classic treatment that are used in many homes and businesses. We do include faux woods in our description of wood blinds. There are many color choices available as well as different decorative tape options for added flares of style. Decorative tapes give you the option to change throughout different rooms so that yo are keeping consistency in your treatment, but adding a bit of personality to each room. These treatments are very easy to clean and last for many years. You have the option for standard cording or a cordless feature, depending upon which manufacturer you choose. Choosing window treatments can be an overwhelming task. We’re going to give you some tips that you can use to narrow down your options. Ask yourself this: What is the most important factor within the space your looking to add window treatments to? Privacy, light control, child safety, motorization, specialty shapes, other? If you can answer this question with one to two options, then you have your starting point. For each post, I will focus on a different factor and product. I will start with privacy, as it is usually our clients’ top concern. Privacy is a major concern for a lot of homeowners, especially when your home is within a few feet of your neighbors. When it starts to get dark, the inside of your home becomes more and more visible to outsiders if your windows aren’t covered. And the worst part is- when you’re inside and your lights are on, its next to impossible to see out. So you’ve decided you need some window treatments that are great at keeping those extra set of eyes out of your home. All window treatments have their ways of controlling privacy. Depending on your budget, there are a handful of different options. My personal suggestion would be plantation shutters. Plantation shutters are one of the most popular window treatments out there- and for a reason. Not only are they beautiful, they last for many, many years. They are also one of the easiest treatments to operate- with either a front tilt bar, or a hidden tilt option. One quick movement opens or closes them. They are also hinged to open like french doors, or hinged to one side so you have the ability to open and expose the entire window to be cleaned or to let some light in. There is the ability to custom shape plantation shutters to fit those specialty shapes you decided to add to your master bedroom before you thought about how you were going to cover them. The louver sizes range from 2-1/2” to 4-1/2”. Depending on how much view through you are looking to gain, you have the three sizing options. Plantation shutters can be cafe style, which is sized to fit the bottom half of your window if your top half does not enable viewing exposure from the outside; full length panels with one tilt bar or hidden tilt option for the entire length of the panel; panels with a dividing rail to separate the top and bottom half of the shutter for privacy below and light exposure on top; and split tilt with no dividing rail for the same feature without a rail in between (see examples below). Plantation shutters can be custom made from wood, composite materials, or vinyl. Each shutter type has its own added features, as well as different pricing options. There is also the ability to choose your custom shutter stain to match existing trim in your home or office. Added bonus: shutters are child and pet safe, as they don’t have any dangling cording! Do you want to add plantation shutters to your home or office? Call us today for a free in home or office consultation!